Reindeer are a type of deer, although in North America they are called Caribou. 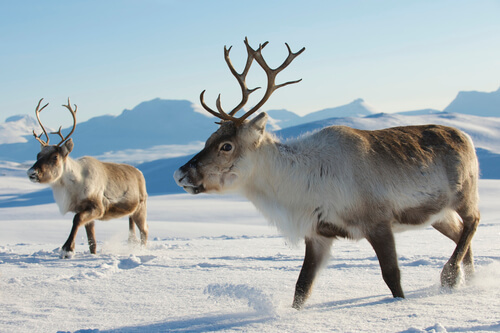 Norway’s Svalbard reindeer is the smallest and the boreal woodland caribou found in Canada is the largest. They are a circumpolar species, which means they live around the Arctic Circle. This includes Siberia, Northern Europe and North America. They live in the mountains and on the tundra in the cold and inhospitable northern regions near the north pole. Their name comes from ancient Norse. The name for reindeer comes from the Norse word hreinn – pronounced like rain – meaning horned animal. They are a herd animal with some herds in Russia numbering up to a million animals, although most herds are much smaller in number. Some herds are migratory, whilst others remain local to one region. Norway’s largest herd is found in Hardangervidda, in southern Norway, where approximately 10,000 of the beasts’ roam. On the northern Norwegian island of Svalbard, near Greenland, a sub-species of dwarf reindeer live in just one very small area. Both male and female reindeer have antlers although the male’s antlers are usually larger. The reindeer are the only species of deer where the female also grow antlers. Both have antlers than can grow over a metre in length and are covered with a soft, dark velvet. Male deer use antlers mainly for fighting over females. However, in areas where food is sparse, female reindeer – like some goats and sheep – have antlers to protect their territory and food. A highly valuable patch of exposed grass in cleared snow is worth often fighting over. Santa’s reindeer are probably female because male reindeer shed their horns annually in late autumn, whereas female reindeer shed theirs after winter. This is because females fall pregnant during winter and need to keep their horns to protect their territory at that crucial time. So if Blitzen has horns in December, chances are she’s Mrs Blitzen. You can tell the age of a reindeer by the size of its antlers. Each year, after their shedding, male reindeer will see their antlers grow back larger than the previous year. And for each of the first five years of a male reindeers’ life it will see them add more points to their antlers. Rudolph really does have a red nose. The reindeer have a specially heated nose that warms the air they breathe before it goes into their lungs. Reindeer also have an inbuilt homing beacon. Their knees make a clicking sound so if the weather gets so bad during a frequent blizzard, they can still find each other with the sound of the clicks. Their hooves are expandable. In the summer months when the earth is soft, the hooves expand to create a larger surface area to make walking in the melting tundra easier. In the winter months they contract to make walking on ice and frozen earth faster and reduce their exposure to the cold. The indigenous Sami people of Lapland have been intertwined with reindeer for centuries. Herding the animals and breeding them for their meat, still to this day makes up a significant portion of their economy. 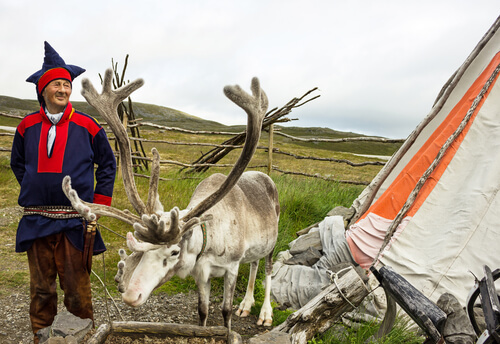 The Sami nomads used to migrate with reindeer and then learn to tame them. They have a built-in life jacket that enables them to swim high in the water. Their coat has two layers of insulation. A dense inner thermal layer and an outer layer of lighter, air-filled fur that enables them to regulate their temperature and also helps them float in water. Night vision helps them see during the long dark months of winter. They can see into the ultra violet range, which means they can see far more than humans. This helps them avoid predators and even see what we can only smell. They run a marathon every day when migrating. Although European reindeer migrate shorter distances, some species will travel 55km a day and can run at up to 80 kmh. They sometimes travel up to 5,000km in one year. Reindeer meatballs anyone? This popular dish can be found in many restaurants in Norway and Finland and are even sold canned in supermarkets. Reindeer meat is tender and lean but is often served as a sausage. It can be smoked, salted or dried and is used in many local dishes. But they have a lot of natural predators too. Eagles and other birds of prey may catch new born calves. Bears, including polar bears also pray on the weak and sick but wolves are the biggest threat to adult reindeer, where packs follow herds around all year. A whole reindeer was found in a shark once! Reindeer used to be a great mode of transport, and although Santa has reindeer pull his sleigh, nowadays few regular people use reindeer power. Reindeer are able to scavenge food for themselves when travelling, whilst dogs need to be fed by their owners, but dogs can travel much greater distances. The annual World Reindeer Racing Championship is held at Easter near the Sami village of Kautokeino. Ski-wearing competitors try to race reindeer, holding only on to reins and hope to make it through the course. Few make it to the finish line but it’s an entertaining way to see reindeer in action. Tromsø in Norway is a great place to discover reindeer. Tromsø Arctic Reindeer Experience introduces visitors to the Sami culture and way of life, and allows people to feed reindeer and ride in a reindeer-pulled sled. Here visitors can also join the Sami around a camp fire, hearing traditional stories and song. You might even catch a glimpse of the famous Northern Lights.